Sadly, in the fall of 2017, we made the decision to sell off our flock of Ridley Bronze turkeys. Although we really enjoyed them and they were fabulous birds to raise, we were just finding that the workload of all the animals on the farm was getting to be too onerous and that something had to go. Unfortunately it was these guys. They truly were characters around the farm and we do miss having them. We would highly recommend them for anyone looking to have heritage turkeys! 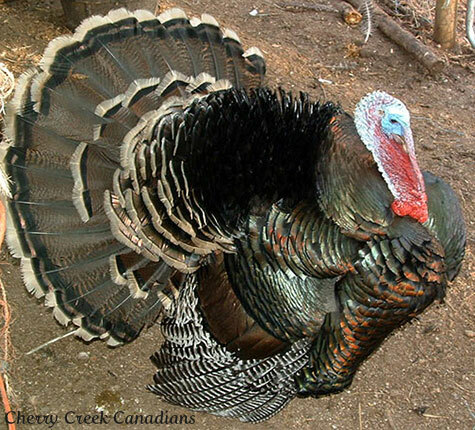 Given our interest in raising other rare, endangered heritage breeds, in 2009, we embarked on a new venture of raising heritage turkeys and given our interest in the other Canadian heritage breeds, decided to focus our efforts on another rare and uniquely Canadian poutry variety - the Ridley Bronze turkey. "A heritage turkey is one of a variety of strains of domestic turkey which retains historic characteristics that are no longer present in the majority of turkeys raised for consumption since the mid-20th century. Heritage turkeys can be differentiated from other domestic turkeys in that they are biologically capable of being raised in a manner that more closely matches the natural behavior and life cycle of wild turkeys. Heritage turkeys have a relatively long lifespan and a much slower growth rate than turkeys bred for industrial agriculture, and unlike industrially-bred turkeys, can reproduce without artificial insemination." "Along with the adoption of the Broad Breasted White by industrial producers, other turkey varieties faded in numbers. Other than exhibition birds and those on a scant few small farms, other turkeys virtually disappeared. By the end of the 20th century, all but the Broad Breasted White were in danger of extinction. Around this time, conservation organization began to recognize the plight of heritage turkeys; the American Livestock Breeds Conservancy (ALBC) considered heritage turkeys to the most critically endangered of all domestic animals circa 1997. A census conducted by the Conservancy found less than 1,500 total breeding birds (out of all heritage varieties) were left in the country. Some breeds, such as the Narragansett, had less than a dozen individuals left, and many considered most heritage turkeys to be beyond hope." When we decided on the Ridley Bronze turkey, as it turned out, they were far more difficult to find and obtain than either our Canadian Horses or Chantecler chickens were. 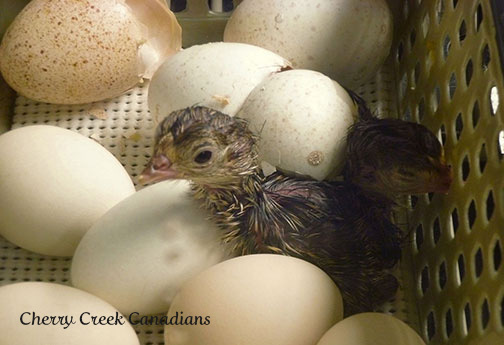 In the end, we ended up having to have hatching eggs flown out at great expense, from Ontario. 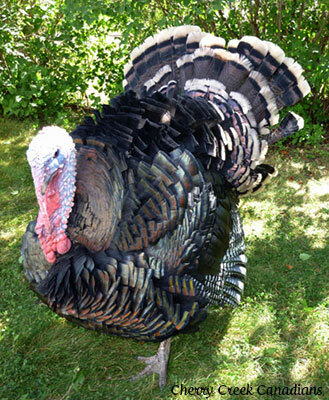 Personally, we have found the Ridley Bronze turkey to be very hardy, intelligent (no "stupid" meat birds these ones! ), as well as very friendly and sociable. Not to mention incredibly entertaining! The hens are very fertile and lay eggs productively. They make fabulous mothers! See the photo in the gallery of the Ridley hen roosting with all of her poults underneath her wings. Sadly we no longer have them, but when we did, we enjoyed them thoroughly. Despite these turkeys being an integral part of our Canadian farming heritage, they are now in grave danger of being lost. A ongoing breed census of RB turkey numbers has been conducted since 2010 with very depressing results. 2010 survey indicated only 90 breeding females left in existence. 2015 survey results show only 250 breeding females. See survey article. These results indicate that the Ridley Bronze turkey is very close to disappearing. This would be incredibly sad as it is a part of our heritage, and also they are one of the few types of turkeys around today that can breed, incubate and rear their own young. 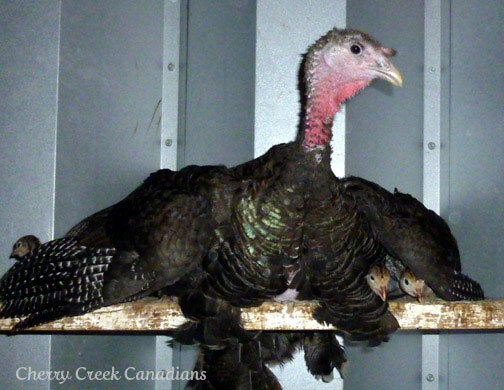 Currently, Rare Breeds Canada continues to classify the Ridley Bronze turkey as "Critical". For more information on this, see the Rare Breeds Canada website. 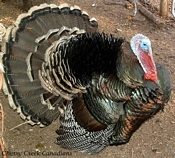 A breed census was done of the Ridley Bronze turkey in 2015. Sadly, there are only about 250 reproducing RB turkey hens left in the world!!! Effective 2018, we no longer have our flock of Ridley Bronze turkeys.